Oh, no! Parmela currently doesn't have any offers on Vegan Cuts. However, check out our monthly boxes for vegan items delivered right to your door! Laurice Do and Ryan Salomone, two vegan personal chefs, perfected the recipe for Parmela over 18 months and launched it to rave reviews in March 2012. 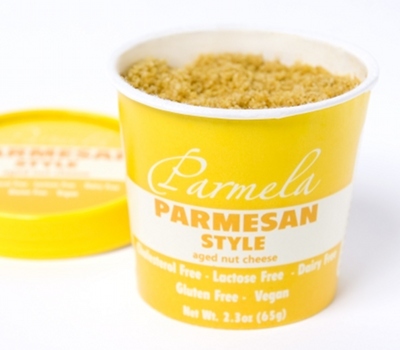 They created Parmela to satisfy the cravings of transitioning vegans looking for an authentic cheese taste. Parmela contains all natural aged ingredients, including fermented soybeans, nuts, and nutritional yeast. These rich flavors are all grated into a tasty almond cashew base, with added nutritional yeast for B vitamins and minerals critical to an energized lifestyle. Follow Parmela and get notified when they add new offers to Vegan Cuts.